Drawing courtesy of graphics illustrator Elaine M. Collins. era approximately 100 million years ago. A "living fossil" may be defined as a plant that lived during ancient times and still survives on earth today. The term was used by Charles Darwin 150 years ago, and also refers to a plant that has been reintroduced and cultivated in a region where it once flourished millions of years before. Depending on how you define ancient times, the definition could probably be broadened to include animals--even professors who lived prior to World War II and who still teach at Palomar College. But seriously, there really are some living "plant" fossils tucked away between the buildings and grassy courtyards of the Palomar College campus and adjacent Arboretum. These are living representatives of primitive spore-bearing and seed-bearing plants that once flourished on earth in very different floras where dinosaurs roamed the land. During the age of dinosaurs (65 to 225 million years ago) the climate, topography and vegetation of the earth's continents were much different from today. Even the spacial positioning of the continents was different. Spore-bearing plants (pteridophytes), such as ferns, horsetails (sphenophytes), club-mosses (lycophytes) and whisk ferns (psilophytes) were abundant in the forest understory. Some of these ancient plant groups were even more abundant in the Carboniferous Period (300 million years ago), long before the time of dinosaurs. The majority of recognizable plant fossils from this time are either leaf imprints in sedimentary rocks or petrified tissue replaced by minerals. All of these plant groups produced spores in microscopic cases called sporangia or in cone-like structures (strobili), and all have living representatives on the Palomar College campus that have changed very little from their primordial ancestors. 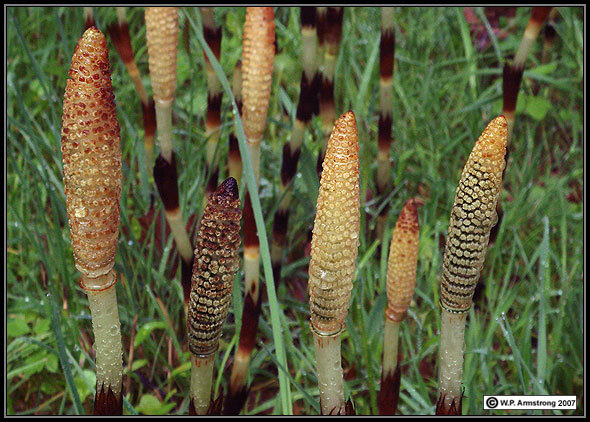 Some are survived by only a few living genera, such as Equisetum (horsetails), and Psilotum (whisk fern). Horsetails (Equisetum telmateia ssp. braunii) in the rain-soaked Coast Range of northern California. Seed plants (spermatophytes) were well developed during the 150 million year reign of the dinosaurs and formed the most conspicuous and dominant vegetation on earth. This is especially true of the lush seed ferns, conifers and palmlike cycads. These primitive seed plants are called gymnosperms (naked seeds) because their seeds are not enclosed in a ripened fruit as in the flowering plants. But if there was ever a seed plant that deserved the title of "living fossil" it is the maidenhair tree (Ginkgo biloba). Leaf imprints of an ancestral species of this tree have been found abundantly in sedimentary rocks of the Jurassic and Triassic Periods (135-210 million years ago) when dinosaurs comprised the dominant fauna on earth. The fan-shaped leaves are similar in shape to the individual leaflets of the maidenhair fern (Adiantum). Although several of these lovely trees are presently growing on the Palomar College campus, they have been extinct in North America for at least 150,000 centuries. A surprising discovery earlier this century uncovered petrified Ginkgo beckii logs from their ancient tomb of sediments and lava flows near the Columbia River Gorge in central Washington. They once formed vast forests in this region over 30 million years ago. All North American plantings of this splendid tree are living descendants of trees only known from the orient, cultivated by people in temple gardens for countless generations. In fact, to this day there is still some controversy as to whether the Ginkgo biloba forests of remote southeastern China are truly native, or whether they were planted by people. But one thing is certain, this remarkable tree has changed very little since it grew in ancients forest more than 200 million years ago, long before the current configuration of today's continents, and when enormous dinosaurs ruled the land. According to K. Bauer, et al. (2013), Ginkgo seedling fossils resembling present-day Ginkgo biloba also extend into the mid-Triassic Period more than 200 million years ago. Bauer, K., Grauvogel-Stamm, L., Kustatscher, E., and M. Krings. 2013. "Fossil Ginkgophyte Seedlings From The Triassic of France Resemble Modern Ginkgo biloba. BMC Evolutionary Biology 2013, 13:177 doi:10.1186/1471-2148-13-177. Accessible On-Line. Characteristic fan-shaped leaves of a living Ginkgo biloba. 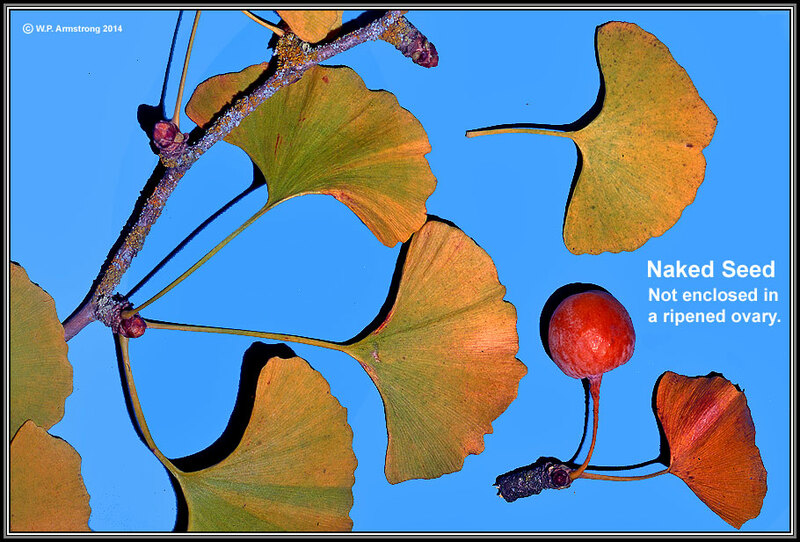 It belongs to the botanical division (phylum) Ginkgophyta, a true gymnosperm with "naked" seeds. This is not a flowering plant, and the cherry-like "fruit" is not a fruit at all. It is a naked seed that is not enclosed in a ripened ovary or fruit, unlike all true flowering plants (angiosperms). The ripened ovary (fruit) is composed of one or more carpels (modified leaves). It is easy to see that the single carpel of a milkweed (Asclepias) fruit (called a follicle) is a modified, seed-bearing leaf (megasporophyll). A 15 million-year-old petrified log of Ginkgo beckii, uncovered from its ancient tomb of flood sediments and lava flows near the Columbia River Gorge in central Washington. Ginkgo trees once grew wild in this region 150,000 centuries ago. Cross section of permineralized Ginkgo beckii. The wood was replaced with minerals under ancient flood sediments and lava flows near the Columbia River Gorge of central Washington. 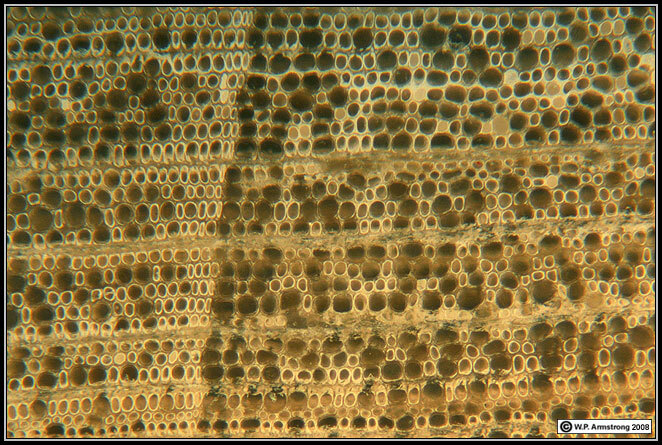 After 150,000 centuries, the cellular structure (tracheids) is remarkably preserved. Magnification 400x. Ginkgo Petrified Forest State Park at Vantage, Washington, on the basalt bluffs overlooking the Columbia River Gorge and Wanapum Lake. Fifteen million-year-old petrified logs of Ginkgo beckii and many other tree species have been uncovered from their ancient tombs of flood sediments and lava flows near this region of the Columbia River Gorge in central Washington. Ginkgo trees once grew wild in western North America 150,000 centuries ago. Ginkgo logs were carried by raging flood waters to the vantage area, where they lay burried in lake bed sediments covered by lava flows for millions of years. Left: A large, female Ginkgo biloba in winter at the Los Angeles County Arboretum in Arcadia, California. Unlike most gymnosperms, such as evergreen pines, spruce, cedars and yews, this species is deciduous and sheds its leaves during the fall months. Right: Maidenhair trees (Ginkgo biloba) line the streets on the campus of Oregon State University in Corvallis, Oregon. During the autumn months, the leaves change from green to yellow as they break away from the spur shoots. One by one they fall to the ground, carpeting lawns and walkways with a layer of golden yellow. Another ancient cone-bearing tree that was thought to be extinct, but was later discovered growing in a remote valley of Central China, is the dawn redwood (Metasequoia glyptostroboides). The genus Metasequoia was first described from fossil material by the Japanese paleobotanist Shigeru Miki in 1941. In 1948, paleobotanist Dr. Ralph Chaney of the University of California, Berkeley led a 10,000 mile expedition up the Yangtze River and across three mountain ranges to a lush, fog-shrouded valley where a thousand dawn redwoods were growing. Leaf imprints and petrified wood of an ancestral species of dawn redwood have been found in Cretaceous deposits throughout North America. Some of the fossils date back nearly 90 million years, from a time when the climate was much more humid than today. It has been estimated that the relict forest in China may have been surviving in this remote primeval valley for countless thousands of years. The seed cones and foliage of the dawn redwood superficially resemble our California coast redwood (Sequoia sempervirens), except that the dawn redwood is deciduous and loses its leaves during the winter months. All North American plantings of this superb cone-bearing tree (including the trees at Palomar College) came from the seeds (or their progeny) originally collected in China. Like the Ginkgo biloba this "living fossil" was finally brought back to its ancestral home. Perhaps the most remarkable of all seed plants that flourished during the days of the dinosaurs are the cycads. These bizarre plants were so numerous in Mesozoic times that this era is often called the "Age of Cycads and Dinosaurs." Cycads have a slow- growing columnar trunk, 3 to 50 feet tall, and a crown of leaves that superficially resembles a palm. Unlike palms, cycad trunks produce rings of xylem (wood) tissue surrounding a wide, pithy central core. [Palm trunks do not produce concentric growth rings.] There are approximately 150 described species of cycads in 10 genera, mostly in tropical and subtropical regions of the world. [Some of the Australian, Mexican and African species grow in arid habitats.] Cycads from throughout the world are also well-represented on the Palomar College campus. Prior to the Theory of Continental Drift, the widely scattered distribution of present-day cycads in Australia, South Africa, Malaysia and the New World was an enigma. How could cycads have such a worldwide distribution when their seeds are too large, heavy and dense to be carried great distances by birds, wind or ocean currents? When cycads and extinct cycadeoids once thrived on earth, the continents were united into an enormous supercontinent named Pangea (approximately 200 million years ago). Evidence from plate tectonics shows that large plates of the earth's crust are slowly moving, resulting in today's isolated continents and widespread distribution of cycads. Although they once represented a dominant and very successful plant line, many of today's relict cycad populations are seriously threatened with extinction due to extensive collecting and diminishing habitats. Indeed, the plight of today's cycads is shared by many endangered plant and animal species that once flourished in vast pristine ecosystems. By the end of the dinosaur era, many of the once prolific gymnosperm species were already replaced by a rich flora of flowering plants, including magnolias, figs, breadfruit, palms, oak, willow, ash and maple. In fact, one hypothesis to explain the demise of dinosaur populations by the end of the Cretaceous Period (65 million years ago) is that slow-growing primitive seed plants could not keep up with the ravenous appetites of gigantic herbivorous dinosaurs, such as the sauropods. Some of the enormous sauropods called apatosaurs (also called brontosaurs) weighed more than 30 tons. Brachiosaurus, one of the largest land animals of all time, weighed up to 90 tons, and consumed literally tons of vegetation in a few days. Compare the weights of these massive dinosaurs with modern-day herbivores, such as hippos and rhinos at 2-3 tons and elephants at 6 tons. When flowering plants began to dominate the landscape, they edged out the conifers, tree ferns and cycads that the long-established sauropods depended on. The competitive advantage of flowering plants is probably a lot more complicated, and undoubtedly is related to changing climatic conditions (and perhaps an enormous asteroid that collided with the earth causing a global dust cloud that blotted out the sun for months). At any rate, flowering plants possessed many adaptive traits that made them particularly resistant to drought and extreme cold. Flowering plants have literally colonized every conceivable habitat on earth, including the extensive, fast-growing, fire-adapted grasslands of today that support huge herds of grazing mammals, and yet many of these vast vegetation types were not around when dinosaurs reached their peak. During the heyday of dinosaurs, the forests and swamps were not scented with the sweet aroma of wildflower blossoms. Instead, the air was probably filled with the copious pollen from seed ferns, cycads, maidenhair trees, and perhaps the odor of resins from other cone-bearing trees that dominated the landscape. A stroll around the Palomar College campus to see some of these "living fossils" is truly a glimpse into the distant geologic past when dinosaurs roamed the earth.